Having a kitchen remodel done is a great way to start the New Year on the right foot. Whether you’re planning on eating better, entertaining more, or just want a fresh start in 2019, having a new cooking space is inspiring. Here are some great ideas to incorporate into your kitchen remodel this winter. Kitchen islands provide a three-in-one solution for storage, beauty, and functionality. They’re a smart kitchen remodel that makes it easy to stash away everything from pots and pans to your recycling bin. They can be used for extra seating, additional food prep space, and eye-catching displays. Are your countertops looking worn from age or use? Years of chopping, spills, and other food prep can take their toll on what’s arguably one of the largest areas of your kitchen. Replacing your countertops can transform the look of your kitchen and make cleaning, cooking, and other tasks easier. 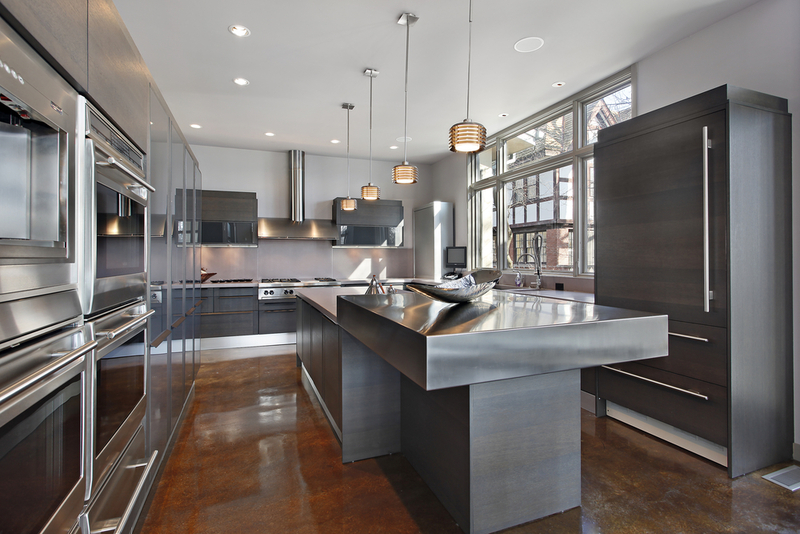 Consider installing an easy-to-maintain material like stainless steel that will last for years and maintain its beauty. How often do you think of the lighting in your kitchen? Consider installing a chandelier over your kitchen island to add a touch of unexpected elegance to your space. If you’re looking for an affordable and easy kitchen remodel project, consider updating your backsplash. This area is a focal point of many kitchens, and the tiles you choose can amp up your color scheme and overall design. Consider a contrasting color or bright pattern to help your backsplash pop and add some personality to your kitchen. Who says you need to hide all of your dishware and cookware behind doors? Swap your cabinets for shelving and showcase your favorite kitchenware. You’ll be able to create art from your functional pieces, whether that’s showing off fancy china or burnished copper pots. Shelving will also make your kitchen appear more open and airy. When you’re ready to begin planning your kitchen remodel, contact the home improvement contractors at Coast to Coast Contracting & Development. Serving all of Northwest, WI, the Hayward contractors specialize in custom home building and have more than 16 years of experience working with commercial and residential clients. Whether you want to upgrade your cooking space, complete a bathroom remodel, or update your roof, you’ll be in good hands with these expert contractors. Learn more about their services online or by calling (715) 790-0662 today.